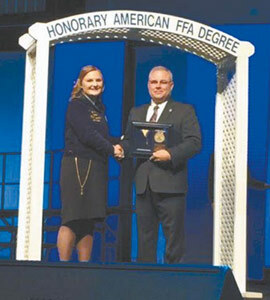 CAPTION: Rusty Black, of Chillicothe, received the Honorary American FFA Degree Teacher award at the 2015 National FFA Convention and Expo held October 28-31. Rusty Black, of Chillicothe, received the Honorary American FFA Degree Teacher award at the 2015 National FFA Convention and Expo held October 28-31. This award is given to those who advance agricultural education and FFA through outstanding personal commitment. The National FFA Organization works to enhance the lives of youth through agricultural education, according to a news release sent from the National FFA Organization. "Without the efforts of highly dedicated individuals, thousands of young people would not be able to achieve success that, in turn, contributes directly to the overall well-being of the nation," the release stated. The Honorary American FFA Degree extends the opportunity to recognize those teachers who go above and beyond for their students and make an extraordinary long-term difference in the lives of the students, inspiring confidence in a new generation of agriculturalists. "I have been blessed in many ways during my 31-plus years as an ag teacher," said Black, who is in his 32nd year of teaching. "I have been very fortunate to work with excellent hard-working ag teachers who have shared their successes with me. The students I have worked with also excelled and I received recognition sometimes for their efforts not my abilities. The recognition by the National FFA is a reflection of our entire ag department and community. I was fortunate to be the honoree for several people that have helped make the ag department and our local FFA chapter the quality programs they have become." Black said there were 46 teachers to receive this honor nationally; eight from Missouri and 140 additional non-teachers. Recipients in the teacher category were selected on the basis of contributions in seven areas: Classroom and laboratory instruction, students' experiental learning, the National FFA Organization, building partnerships, agricultural education program marketing, program development and evaluation, and professional development of agricultural education teachers. Teachers must have also taught a minimum of 10 years, and their agricultural education program must have had 85 percent membership in the past year. Members of the National FFA Organization's board of directors approved the nomination. At the convention, Black received a certificate and a medal, and his name was permanently recorded.